Parque Colon or Columbus Park is among the historically significant landmarks in Aguadilla. This park is special because it has something for everyone who comes to visit it — a wooden boardwalk which overlooks a small beach, playground equipment for children, and a big wooden treehouse that both adults and children admire. The tree house is a massive wooden structure which is built around a large banyan tree. There are signs along the walkway which describe the flora in the park. These signs also provide useful information about the history of the place. The park overlooks the oceanfront with spectacular views on offer. It also houses the cross monument (Cruz de Colon) which marks the spot where Christopher Columbus supposed to have landed in Puerto Rico in the year 1493. Tips & Warnings: Driving directions to the park — follow Road 440 south along the ocean. Road 440 becomes Road 442 or Paseo Colon. Continue south on Paseo Colon until you reach the park. Visit Aguadilla Ice Skating Rink or Skater Park. How popular is Parque Colon? People normally club together Unique Outdoor Experience and Crash Boat Beach while planning their visit to Parque Colon. Here you can enjoy a good day with family and friends you can find mini donuts popcorn pinchos hice cone its really good. Parque Colón is a great place to walk in the mornings! It's the longest and most beautiful waterfront boardwalk in Puerto Rico and you'll always find nice people exercising there. 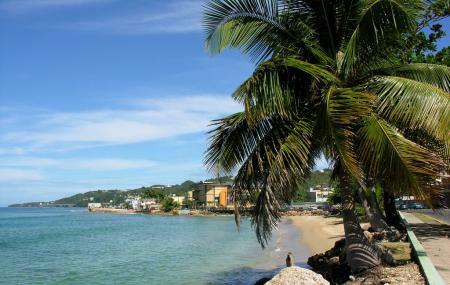 I greatly recomend it and you should take your time while there to observe the beauty of the Aguadilla Bay. For the people who know the park now is just a sight to visit because still the tree house but that it's. No play ground no nothing else. I do exercise in the morning but make me sad everytime I go there. Beautiful place in need of some remodeling after the hurricane but still amazing!